Shani Dev, in Hindu tradition, is one of the most important deities that the devotees pray to ward off evil and remove hindrances, both spiritual and material. He is also one of the Navagraha (the 9 primary celestial beings in Hindu astrology) of Jyotisa. He is embodied in the planet Saturn and is the Lord of Saturday. Moreover, He is also known as Sanaiscara. The Sanskrit word ”shani” comes from Sanaye Kramati Saḥ, the one who moves slowly because the planet Saturn takes about 30 years to revolve around the Sun. He is most powerful in the 7th house. Saturn rules over the 2 sidereal signs of Aquarius and Capricorn. Furthermore, He exalts in Libra and falls in the sign of Aries. Saturn is an especially beneficial planet for Libra and Taurus ascendants. He is represented as having a dark color and is said to be the son of Lord Surya, known as the sun god, and Chaya, the servant whom his wife Swarna surrogated. He is the brother of Lord Yama, the god of death and is considered by many to be an avatar of Lord Shiva. Saturn’s gravitational power is more than that of the Earth’s. Hence, when we think bad or good thoughts and make plans, they reach Him by the amazing strength of his power. In astrological terms, the bad influence is considered as unlucky. But the result of good deeds (positive karma) will be good. Thus, we must understand Him as a friend and not as a foe. And for bad deeds, he is Sade Saathi, an enemy and disaster. 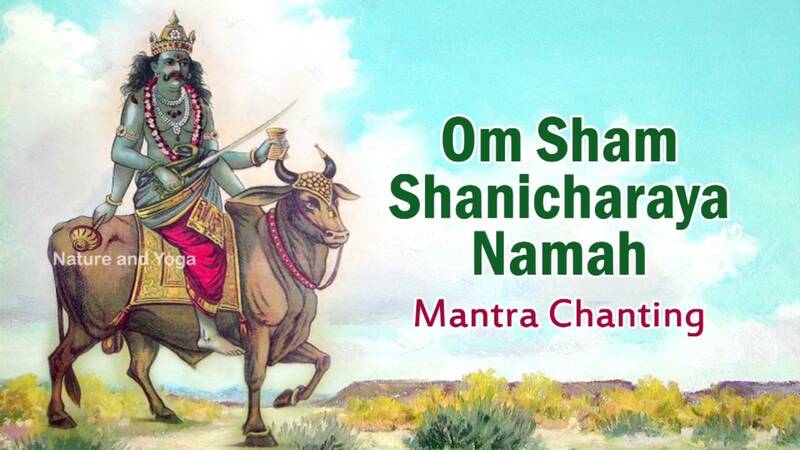 Grah Shanti and Shani Pooja Shani Puja are some good and powerful remedies done to appease the planet Saturn and reduce the difficulties one will have to face during such bad times. Aside from that, there is a number of easy to do remedial measures one can follow including daily chanting this mantra regularly. These mantras have to be recited, for optimal results, facing the west and a minimum of 7 times a day. However, a practitioner can recite the mantra 108 times using a rudraksha rosary (or a mala) and by keeping a yantra for even better results. This entry was posted in Hindu Mantras on February 22, 2016 by admin.